ANN ARBOR—"Porgy and Bess" has been called the first great American opera, made all the more significant by being set in a black American community and performed by black artists in 1935, a time when black culture was exoticized by the country's white majority. 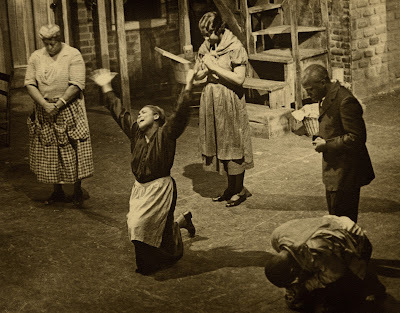 Over the following 80 years, it became one of the most celebrated American works of the 20th century, while simultaneously igniting controversy every time it was performed due to its themes, characterizations and appropriative nature—an opera about black Americans created by white artists. Despite its fame and undisputed place in American music history, "Porgy and Bess" has never had a definitive score. Over the last three years, editors at the University of Michigan's Gershwin Initiative have been hard at work righting this wrong, creating a new edition of the opera. And now, Ann Arbor audiences will have the chance to experience a crucial step of the editorial process. A test Performance of the new score will take place at 7:30 p.m. Feb. 17 at Hill Auditorium. Through a partnership with the University Musical Society, led by Kenneth Kiesler and featuring critically acclaimed professional soloists, "The Gershwins' Porgy and Bess" will be performed by the University Symphony Orchestra, U-M School of Music, Theatre & Dance choruses, and members of Emeritus Professor Willis Patterson's Our Own Thing Chorale. The concert will provide audience members and performers alike the chance to experience the newly edited score, which restores material often cut in past productions. The score now includes an onstage band in Act II, which has not been performed since the opera's preview in Boston in 1935 (prior to its first production that year on Broadway). This unstaged concert is another in a series of test performances at U-M for The George and Ira Gershwin Critical Edition, following readings of "An American in Paris" and Concerto in F in September 2016, and the 1924 jazz band version of "Rhapsody in Blue" in October 2014. The test performance will be a highlight of the USO's concert season, featuring distinguished soloists, including Morris Robinson as Porgy, Talise Trevigne as Bess and Chauncey Packer as Sportin' Life. Current SMTD voice student Rehanna Thelwell will sing the part of Maria, and eight other SMTD students—Dorian Dillard, Darius Gillard, Julian Goods, Camron Gray, Lenora Green, Goitsemang Lehobye, Edward Nunoo and Yazid Pierce-Gray—will perform solo parts. SMTD alumna Janai Brugger, who is making her mark on opera stages across the globe, will sing the role of Clara. While the critical score of "Porgy and Bess" remains several years away, the performance materials being developed now will receive their official world premiere in 2019 at the Metropolitan Opera in New York. In conjunction with the performance, students and community members are invited to attend or livestream a scholarly symposium on issues of race in "Porgy and Bess," which will unpack the opera's complexities and controversies. Speakers—including students, scholars and performers—will confront the wounds of prejudice within this work, from both historical and contemporary perspectives.